Tomorrow is my mother's 84th birthday: happy birthday to you in Helena, Mother. So I packed up all the supplies I had purchased and mailed them, with the instructions, to Mother. She had never even heard of Cathedral Window quilts before then, but she promptly made a pillow and wall hanging and sent them back to me. Later, I got a larger wall hanging, which is in my foyer right now. From there, Mother turned to queen-sized bed quilts. She used twin flat sheets to make the backing of the quilt and each one required seven twin sheets. A lot of fabric!! Then the individual "stained glass" squares had to be cut and appliqued on to the quilt. Hundreds of them. 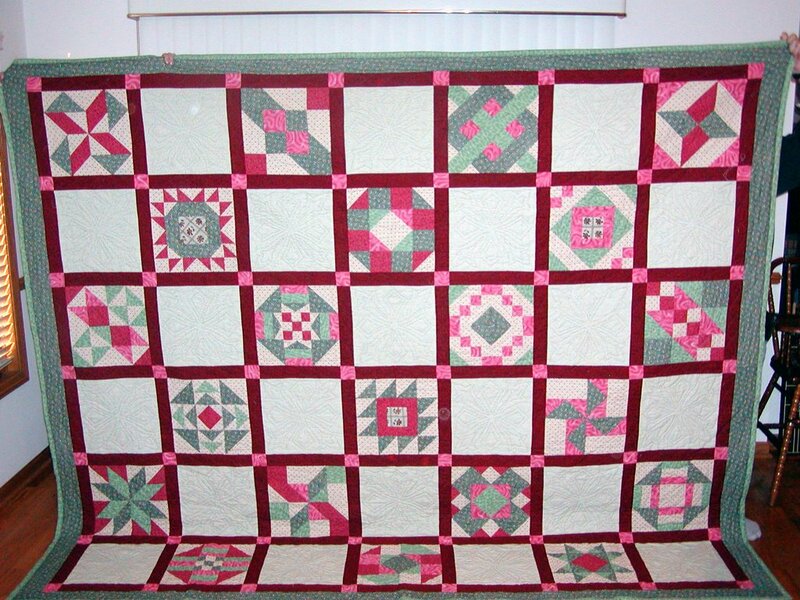 The old theory on this type of quilt said that they had to be random patterns, but Mother did not think so. After the first few, she got out her graph paper and started graphing designs. Each box on the graph paper became a square of the stained glass. Doing this, she developed elaborate patterns, from an English garden, the hearts, to a Native American style pattern. Her choices of colors and fabrics is impeccable and detailed. 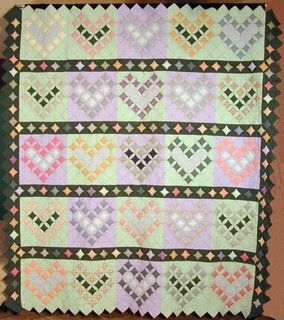 For example, Alix's quilt has large hearts created from blocks of the stained glass fabric and each square of printed fabric in the quilt also has a heart pattern in it. This is Alix's wedding quilt. Mother made a quilt for each of her daughters, daughter-in-laws, and granddaughters (for their weddings). Then she started making quilts for her sons and grandsons. Then for great-grandchildren. About five years ago, she stopped making Cathedral Window quilts and started piecing and quilting traditional quilts instead. Over the last 15 years, Mother has constructed more than 60 quilts, most of then queen-sized. Recently, she mostly makes crib quilts for the many great- grandchildren who keep coming along. 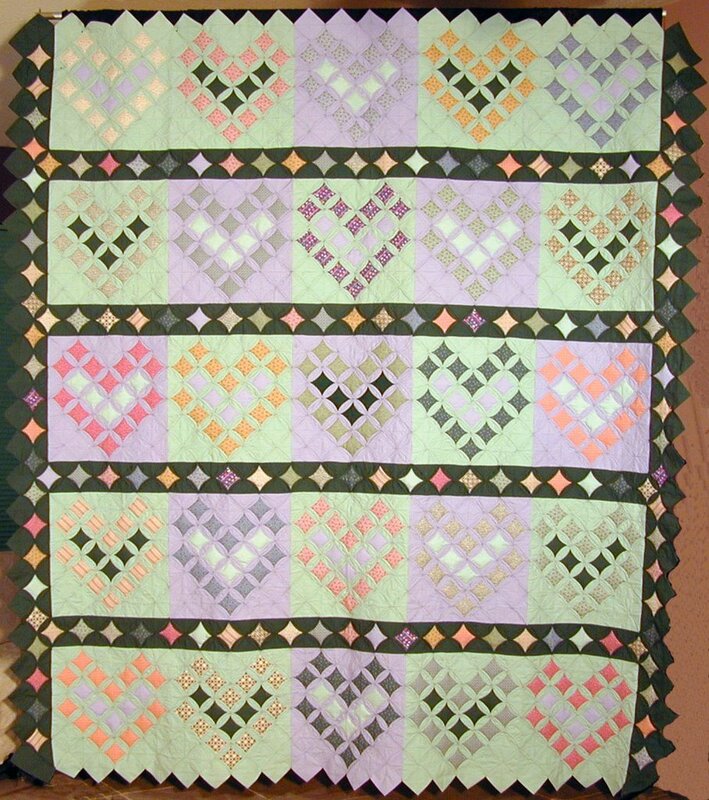 This quilt is an example of her traditional quilting. She made for my late nephew Steven. Last year for her birthday, I made her a quilt book commemorating her life as a quilter. All my siblings and all their children contributed photographs for the book. Each one also offered a comment that I included in the book. It pleased Mother a lot. When she no longer makes quilts, I am to update the book and make it available to the family. Mother told me that she would not make any more quilts except baby quilts after she completed mine. I am thrilled to have her "last" quilt. She complained that the quality and workmanship were not up to her standards, but when I saw the quilt I couldn't tell why. It looks just beautiful to me.